Dairycon 2010 Exclusives, Part One: Battle for Brew City! Ticker vs. Uncle Whiskey Breath! Read the exciting saga here! 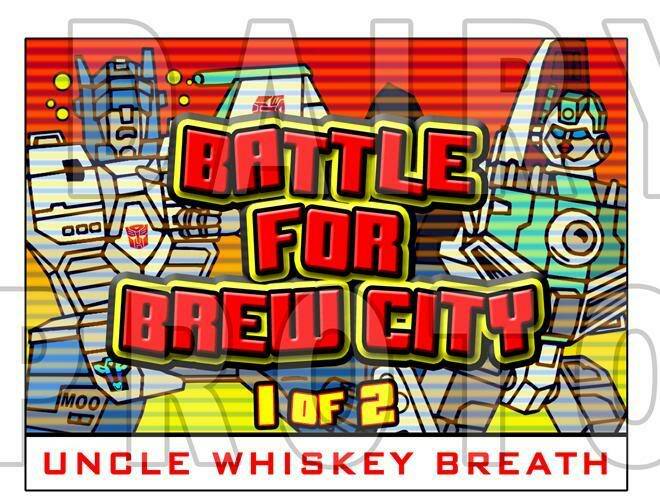 "Faced with a critical fuel shortage, the Dairycons enlist the help of their stalwart ally, UNCLE WHISKEY BREATH, to make a special run to BREW CITY. They are in-need of precious energon in order to power a full-scale assault. Suddenly, TICKER attacks! Her mission is to prevent UNCLE WHISKEY BREATH from returning to the Dairycons. Can PRETENDER CONVOY arrive in time to ward off the attack?" Quote: "Hey Dere! Cold 'nuff fer ya?" Sent by Optimus Prime to be the guardian of the Midwest. Spending time amongst the inhabitants has caused him to pick up some of their mannerisms over the years, most notably their peculiar pattern of speech. Appropriately-named 'Blizzard shotgun' freezes enemies solid upon impact. 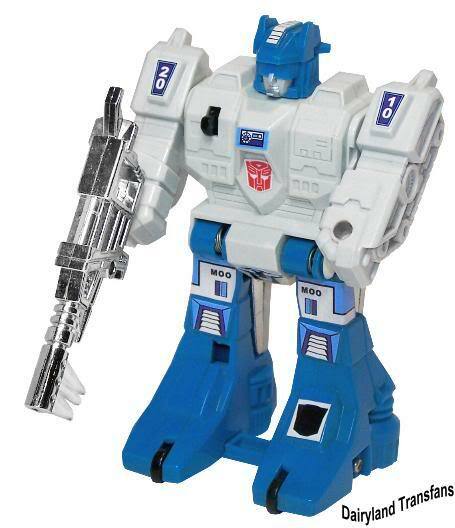 Cybertronian vehicle mode allows him unprecedented mobility over nearly any snowy terrain. Rumored to be equipped with experimental 'Cloak of Cow'(allowing him to blend unnoticed within the midwestern landscape) and Wedge of Doom(a piece of electrum cheddar whose purpose remains a mystery). Partnered with his on-again, off-again ally WindChill, part of the Stormsword team. Cybertronian form doesn't blend in very well with the native environment(neither does a giant robotic cow, for that matter). Can occasionally overfuel on energon, leaving him immobile for hours. Quote: "My Touch is your Remedy." 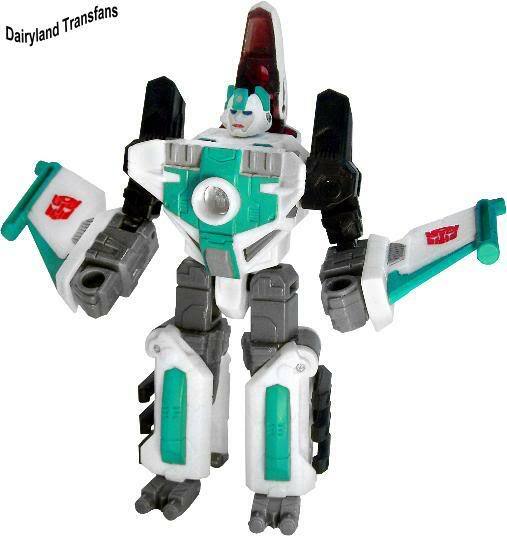 Until recently, TICKER was a medic on the Autobot colony world of Paradron. When the planet was destroyed to prevent it from falling into the hands of the Decepticons, she traveled to Earth instead of Cybertron to seek out her destiny. Now, she serves with a group of half-wits and drunks. Believes in healing a Transformers mind, not just their body. Has studied alongside such greats as Ratchet and First Aid. Combines the latest medical know-how with her own sometimes unproven methods. Occasionally partners with Scoot and Minerva for riskier Dairycon missions. TICKER is a highly competent nurse and medic. While she is widely versed in standard medical care like her colleagues, she also tends to rely on more experimental procedures and new-age, or "faith" healing. This often leads her into disagreements with MINERVA regarding the best course of action to take. Her newly rebuilt body transforms into a Medical Evacuation shuttle. Rescue claws on the underside of shuttle retrieve fallen comrades off the battlefield. Shuttle is capable of achieving earth orbit. Her compassion for the injured, be they friend or foe, can not only place her into danger, but lead to conflict with her allies. Her preference for more esoteric forms of medical care can sometimes place her patients in more danger than their injuries alone would. Notes: Uncle Whiskey Breath, the very first Dairycon Exclusive (see 2001) has been reissued for the 10th Anniversary! Referred to by insiders as a 'Pasteurized', or 'Dairycon Classics Reissue', Uncle comes with a number of the same accessories he was issued with years ago, as well as a few new surprises. Ticker, whom fans have been clamoring for, has finally seen release in the Dairycon line, as a potential enemy (and possible ally) of Uncle. 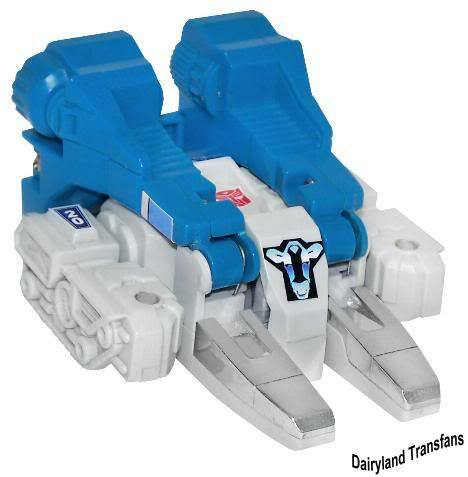 Originally listed as a 'Paradron Medic', Ticker was the final figure in the original Dairycon storyline (10 years running) that awaited release. Wait no longer! These items are part of the 'Battle for Brew City' assortment, and are the Regular Raffle items for the 2010 Convention.